Happy Fourth of July friends! I hope that you are all enjoying your families and festivities! 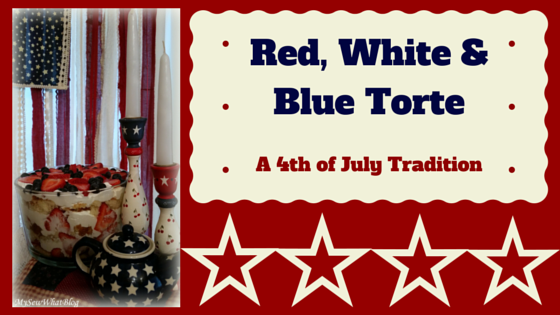 This year we are celebrating the Fourth of July much more quietly than in years past. Our three daughters are unable to be here with us to celebrate but I still wanted to pull out some red, white and blue to make the day a bit festive. 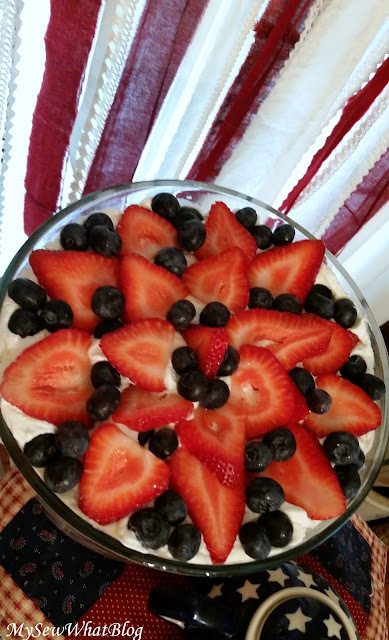 I also had to make our favorite red, white and blue strawberry and blueberry torte. I have been making this dessert on July 4th for years and years and I am a stickler for traditions... and so the tradition continues! I posted the recipe for this torte a couple of years ago when my daughter requested it for her birthday. The original post with the recipe is here. 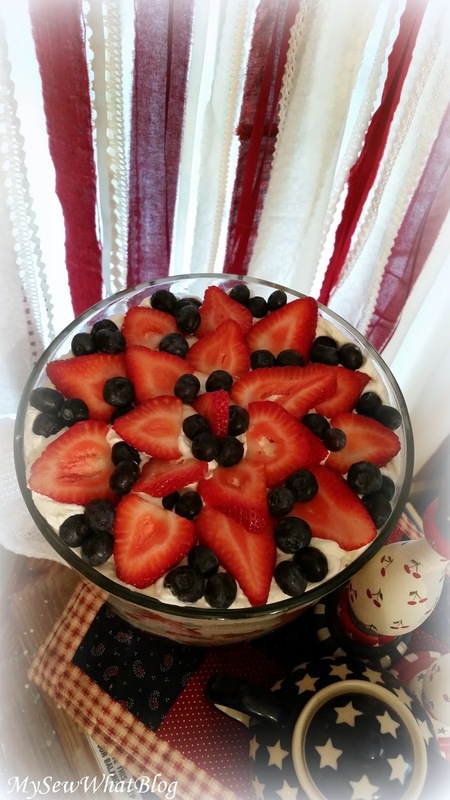 I believe I left the blueberries out of that particular cake but you will want to put blueberries in if you make this delightfully delicious cake as part of your Fourth of July menu. The creamy filling is a combination of whipping cream, confectioner's sugar, cream cheese and almond extract. It is layered with strawberries and vanilla almond cake and on the top layer I add 50 blueberries. Yes, I counted them out, one for every state in the Union. 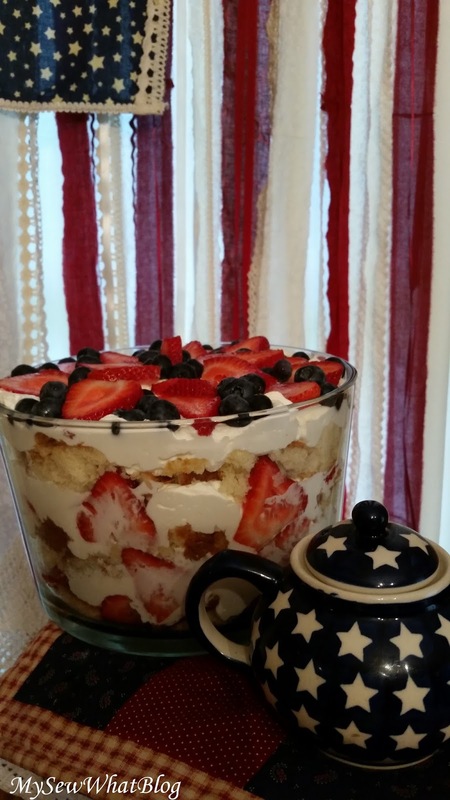 If I had a bigger dish and a larger crowd to help us eat it, I would absolutely make 7 red layers and 6 white. Since I will be enjoying some torte with hot tea (it is cool and rainy today) I have a reason to pull out my little blue and white starred teapot. Isn't is the cutest thing? A friend of mine (she is a fellow tea lover) gave this teapot to me for Christmas. I love it! I wonder if I can find a red and white striped teapot to go with it? 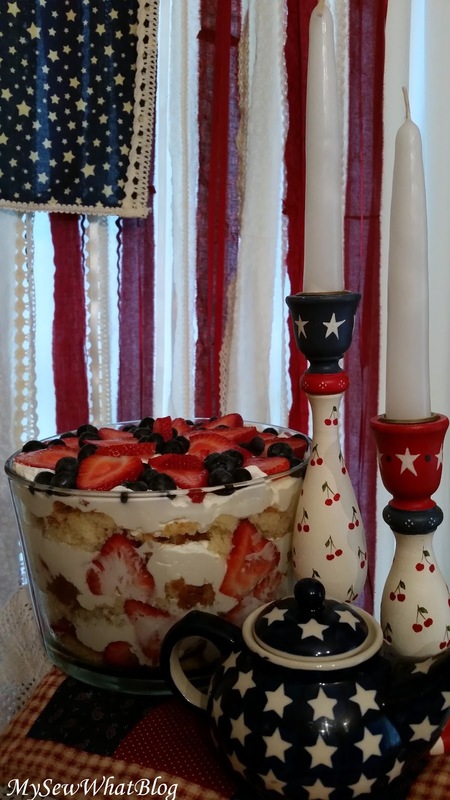 Of course I also got out my red, white and blue candle holders that Diane made--she blogs over at (The Checkered Apple) I won them in her giveaway last summer and I use them whenever I need a little red, white and blue! dessert and coffee/tea. They have enjoyed this treat for many years, so this year should be no different. "Every good citizen makes his country's honor his own, and cherishes it not only as precious but as sacred. He is willing to risk his life in defense and is conscious that he gains protections where he gives it."